François Couperin was a French composer, organist and harpsichordist of the Baroque period. He was known as Couperin le Grand (“Couperin the Great”) to distinguish him from other members of the musically talented Couperin family. It is not necessary to adhere too precisely to the beat in the Double above; one must sacrifice everything to appropriate expression, to the clean execution of the passagework, and to softening the accents marked by the mordents. 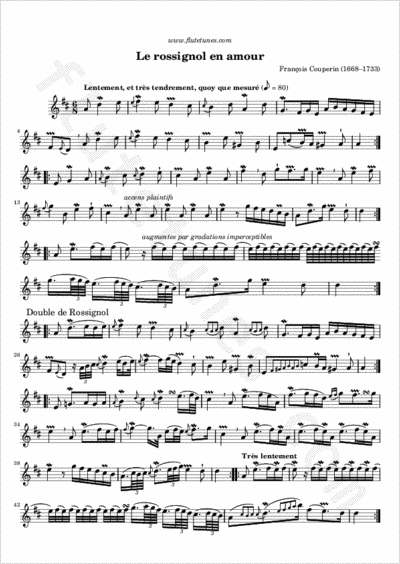 This “Rossignol” can be performed with the greatest possible success on the flute, when it is well played.